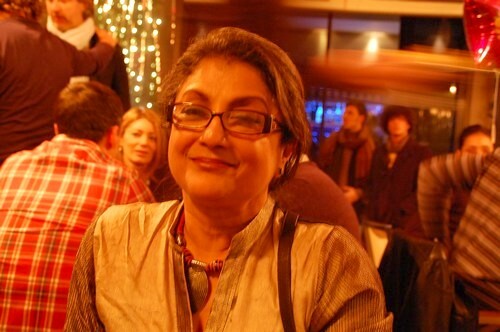 In December 2010, during the River to River Film Festival, I had a brief talk with well known film actor and director, Ms. Aparna Sen. Two of her films were at the festival. Her new film, "Iti Mrinalini" (2011) opened the River to River Film Festival, while the beautiful and lyrical "The Japanese wife" (2010) was the festival's closing film. Both the films were loved by the people but then Ms. Sen is no stranger to rave reviews, right from the first film that she directed almost 30 years ago - 36 Chowranghi Lane. As a teenager, I had a huge crush on Aparna Sen and to talk to her was a great moment for me. We were sititng in a bar near the Odeon cinema, a heritage cinema building in Florence, where festival was being held. Here is a transcript of my interview with Ms. Sen.
Sunil: I can't believe I am sitting here talking to you. I had first seen you "The Guru" probably in 1970! Aparna: No, it was not 1970, it must have been much later ... no, probably you are right, it was around 1970. Aparna: Apart from being a film critic, actually both my parents were the founder members of Calcutta Film Society, so what it meant was that as a child I was brought up on a diet of best of the world cinema. My taste in cinema was formed by that experience. I was seeing films like Battleship Pottemkin, Ivan the Terrible (1) and Passion of Joan the Arc (2). So these were the kind of films, I was brought up with. Sunil: I read some where that you did your first film when you were ten years old? Aparna: No, it is wrong, I didn't do any film when I was ten. Sunil: So your first film was Teen Kanya (3) .. did you realize at that time that you were working with the great Satyajit Roy? Aparna: Not really. I mean, I knew that he was a big director, but for me, more than anything else, he was a friend of my father. It was a lovely story that I had read recently at that time and I had liked the story very much. I liked being Mrinmoyee. It was very exciting, but for me it was more like a picnic. I didn't have to go to school, no exams. So it was lot of fun. Sunil: And going back to school after doing the film, how was it? Had you become famous? Aparna: School was awful after that. After all the excitement, the routine of the school was terrible and there were people who made fun of me, made little remarks and all that. I had also missed my exams. I went back to school in time to give exams on 2-3 subjects. I did very well in those subjects. I was very good at English and history. I think that probably I came first in those subjects, but on the whole, I was no where because I had missed on so many subjects. We had a kind of marks reading meeting at the end of the year and when the principle read my marks, she said something like, "Oh, so we are more interested in our acting than in our studies", or something like that, sarcastic, and I was close to tears. Sunil: You spent part of your childhood in a place called Hazaribag? Aparna: My grandfather used to live there. He was a Brahmosamaj missionary and he had a nice interesting, charitable dispensary over there. It was a beautiful house with a garden, very simple and austere, but very beautiful. We used to go there every year during our holidays. For our holidays we always went there to Hazaribag, especially in winters. It was lovely. Sunil: You have done lot of films. Was there a character you hated doing, which you thought was completely unlike you? Aparna: Sometimes you had to do films as a mainstream actress where you didn't like it and you were doing it just for the money. I did a film called Abhichar in Bengali, I didn't want to do it, so I asked for a huge sum of money. But they said yes, and so I had to do it. But I didn't like it at all, I hated every minute of that role, it was directed by Biswajeet Chatterjee. Sunil: Biswajeet the actor, Prasanjeet's father? Aparna: Yes he directed it. Sunil: Your mother was cousin of a well known poet ..
Sunil: Did you write poetry too? Aparna: Not really. I mean I wrote poetry like everyone does in their youth but it was nothing important. Jibananda Das was one of the great poets after Tagore and he was my mother's second cousin. He was also very close to my parents. Sunil: Did your mother write as well (4)? Aparna: Yes, she wrote short stories. Sunil: Did you feel that you were not very successful in Hindi cinema? Aparna: (smiling) I didn't try very hard, my heart was in Bengal. I always made my Hindi films for the wrong reasons. Like when I had an income tax installment to be paid or needed money for a car ... I never did a Hindi film for the right reason! PS: Actually I had prepared lot of questions to ask to Aparna Sen, but there was not enough time for a proper discussion. On lot of different things, I would have liked to ask more and understand more. However I was very much aware that in another ten minutes, Onir's new film "I Am" was going to start and we both wanted to see it. And I was also a little overwhelmed by the idea of being with my teenage crush! May be there will be another opportunity to meet her and to interview her with more in-depth questions. Inshallah. (3) Teen Kanya: directed by Satyajit Ray, came out in 1961 when Aparna was 16 years old; the film was based on works by Ravindranath Tagore, it had three stories and Aparna played the role of tomboyish Mrinmoyee in third story, Samapati. On that same story, Samapti by Tagore, Rajshri films had made "Uphaar" in 1971 where the role of Mrinomoyee was played by Jaya Bhaduri. (4) Aparna's mother was Supriya Dasgupta.